The folks at Dreamfarm have a quirky way of naming their products. Supoons are yet another in the quirky name category. They're spoons. Or spoon-like spatulas. The Supoon is a "sit-up scraping spoon" and comes in two sizes and a pretty big array of colors. Yay, colors! The end is flat and square so you can scrape or squeegee food in a pan. The sides are fairly soft so you can squeeze, mush, and fit the spoon to the surface you're working with. 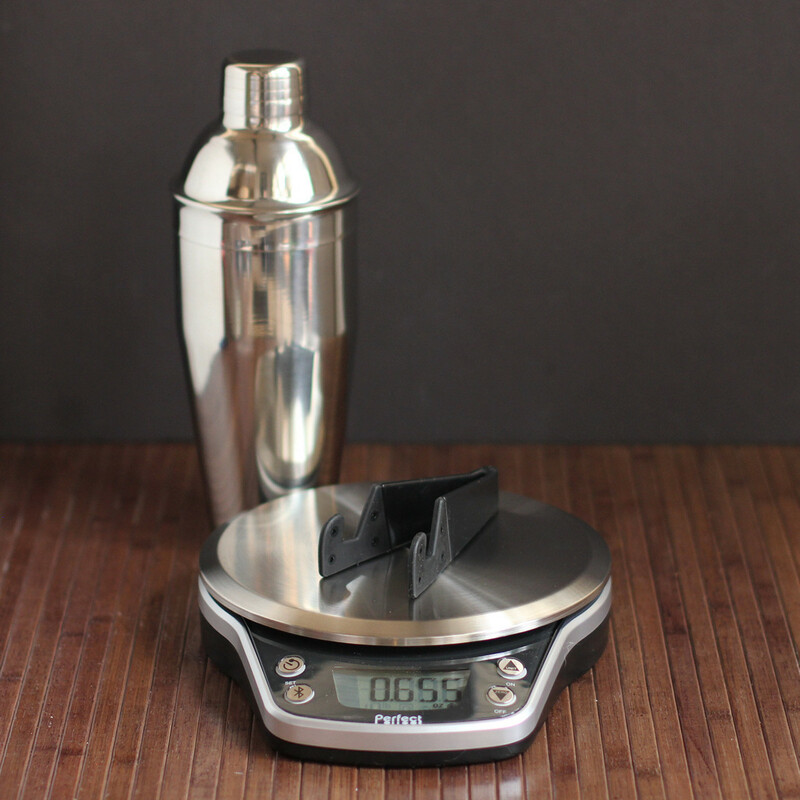 And there are measuring marks, so you can use them for measuring ingredients. The measuring is a really nice touch. I wouldn't rely on it if I needed a precise amount, since you can't level inside a spoon. But it's great if you need a rough teaspoon of oregano or something like that. The Supoons also have a bent handle so when you sit the Supoon on a counter, the head of the spoon stays off the counter. Sure, it can still drip a little bit, but at least you're not setting the spoon on the counter and then sticking it back into the pot, right? I really kind of loved the little Suppon. I'm finding more and more uses for small flexible spoons when I cook. Who's it for: Pretty much anyone who cooks. They'd be nice gifts, too. Pros: Hey, they're spoons. They do spoon-like things very well. Cons: More expensive than cheap spoons. Wishes: More colors! Hah. Colors are so cool. 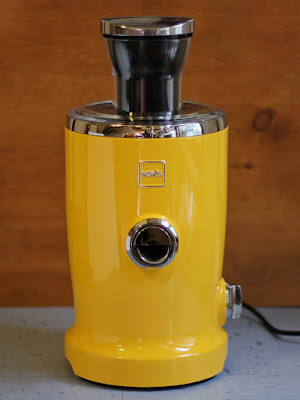 I've reviewed a whole lot of juicers. Some are slow, some are fast. Some eject the pulp. some don't. But most juicers are for juicing vegetables, pit-free fruits, and greens. Until now, juicers weren't of much use for citrus fruit. 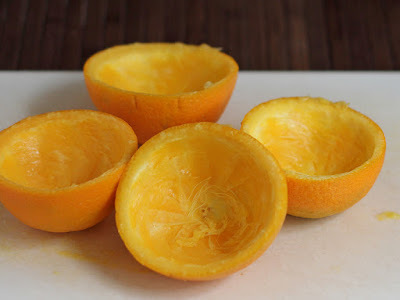 I mean, you could certainly peel an orange and toss it into the maw of a regular juicer. But that's kind of troublesome. And messy. So, if you wanted to juice lemons, limes, oranges, or the rest of their relatives, you had to press or ream them manually, right? I have squeeze-type juicers and several types of reamers, and they work fine. Or let's say that they're fine when I only need a few limes or lemons. When I'm making key lime pie or I need a lot of juice for curd, manually juicing citrus isn't a lot of fun. But now ... NOW! 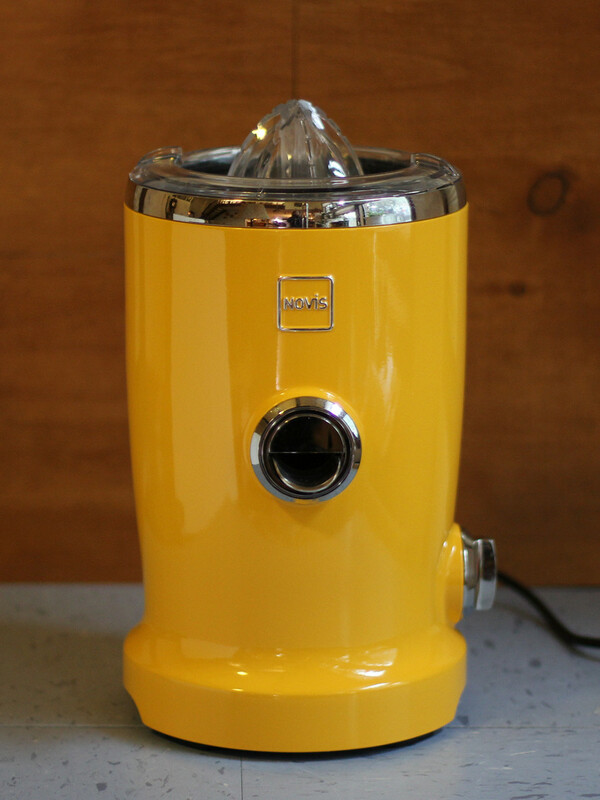 There's a juicer that does that regular juicing, but quickly switches to let you power through citrus - the Novis Vita Juicer . Well, it doesn't switch - you switch a few parts and you can juice citrus - and you can control whether you want your juice pulpy or not. This is kind of a game-changer. Well, it's a game changer if citrus-juicing is something you do. Lemon curd is soooo much easier with this machine. So much. I'll probably juice more citrus just because it's easier to do. I tormented a bunch of different fruits and vegetables, and I was really pleased with the juicing results. I was also very pleased when it came time to clean the juicer. 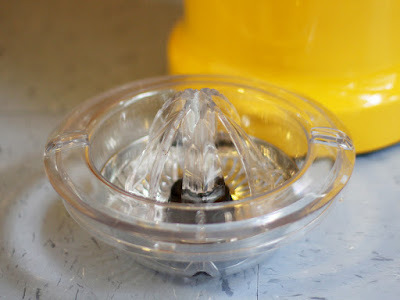 Unlike similar juicers that have a bowl-like centrifuge-thing (I have no idea how else to describe it!) this bowl-thing has a bottom that comes out, which makes it a LOT easier to clean. A lot. It's genius. When it came to citrus, I was surprised at how little was left behind in the skin. This is great when you want a pulpy juice, but also when you want just the juice without the pulp, since you can let the machine strain the juice for you. Best thing, though, was that when I was juicing a lot of oranges, I got a LOT more juice than if I just squeezed them by hand. Nothing left here - all the juice and pulp is gone! Who's it for: People who juice and want a better way to handle citrus, too. Pros: Works well, Juices pretty much anything I want to juice. Lots of colors to choose from. Wishes: I keep thinking, well, what else could it do? But I'm stuck. It's a juicer. It juices. If you ever happen to need to squeeze a lime at the same time you're fighting off a bear in the woods, the Barbarian Bar Tool is for you. The Barbarian Bar Tool is a citrus squeezer with other tools attached - opener, corkscrew, zester, knives, can opener - pretty much everything you'd need to make cocktails. Well, except the glass and ingredients. You need those, too. 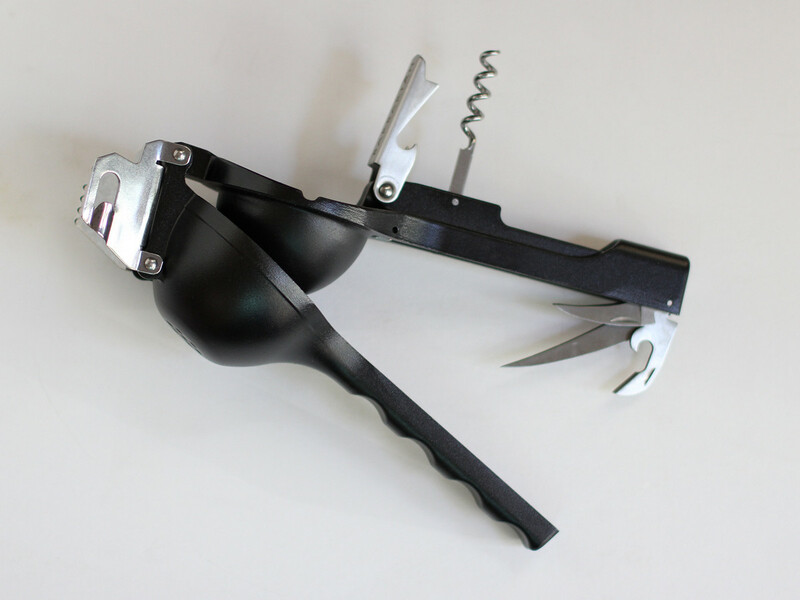 While it might be easier to pick up a knife to cut a lemon, if you've got limited space for tools or you're taking this with on a picnic or camping, or you want to show off a fancy cocktail tool at a home party, this is definitely for you. It just looks mean. The citrus squeezer itself is sturdy and works well. I haven't used all of the other tools, but I've fiddled around with them and they all seem appropriate for their tasks. Who's it for: Cocktail makers. Pros: It does pretty much everything. Cons: It's a tad expensive. Wishes: What! No grater? Just kidding. I think it does enough. 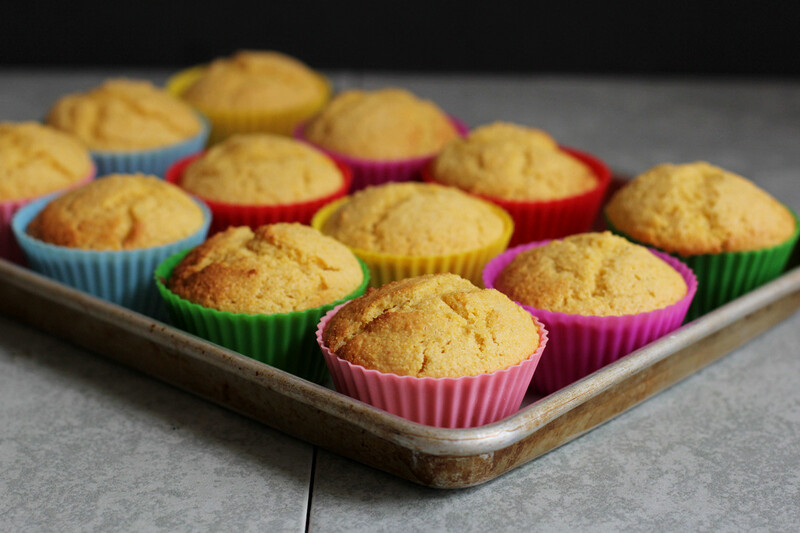 What do you do with your family recipes? If you're a blogger, you probably post them online. But if you're a normal human, what do you do with them? My mom had a lot of recipes that she made regularly - oxtails in a zesty tomato sauce, pork shoulder steaks with bell peppers, spaghetti sauce, tomato soup ... lot of them. She made them from memory and adjusted by taste. As she got older and didn't cook as much, she started forgetting how she made some things. As she got grumpier, she refused to give me any of the recipes. So I had to recreate them from memory. 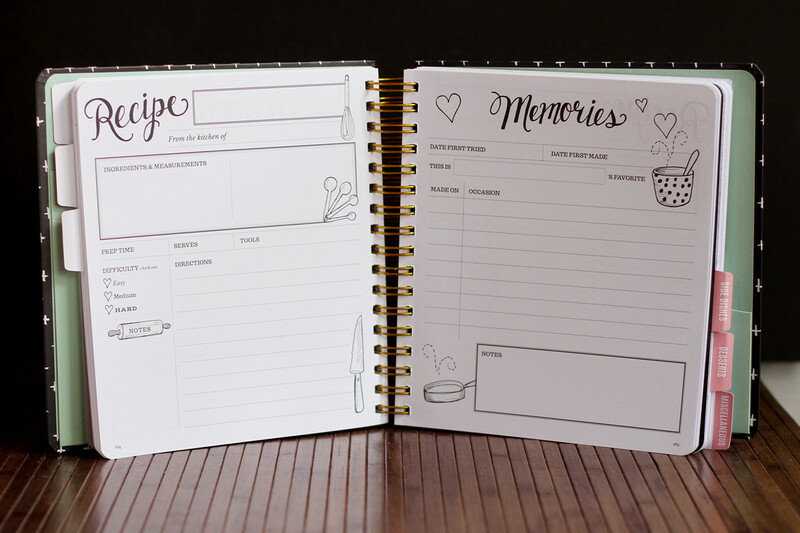 Moms who want to keep their favorite recipes might want a pretty place to put them. 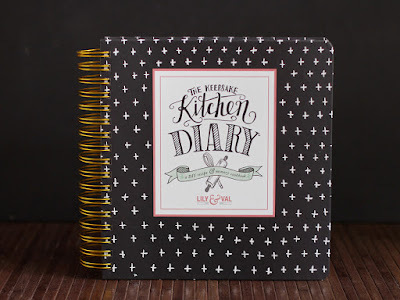 Like the Keepsake Kitchen Diary from Lily and Val. It would also be nice as a gift for a new bride, with recipes from different family members. Or just a good way to collect personal recipes for personal use. Or a way to collect recipes from friends. Recipe pages are on the left, and the facing pages are for collecting memories - where you first tasted it, when you first made it, and a list of other times the recipe was made. There are tabbed pages to separate categories of recipes, and there are pages with useful information, like volume conversions. 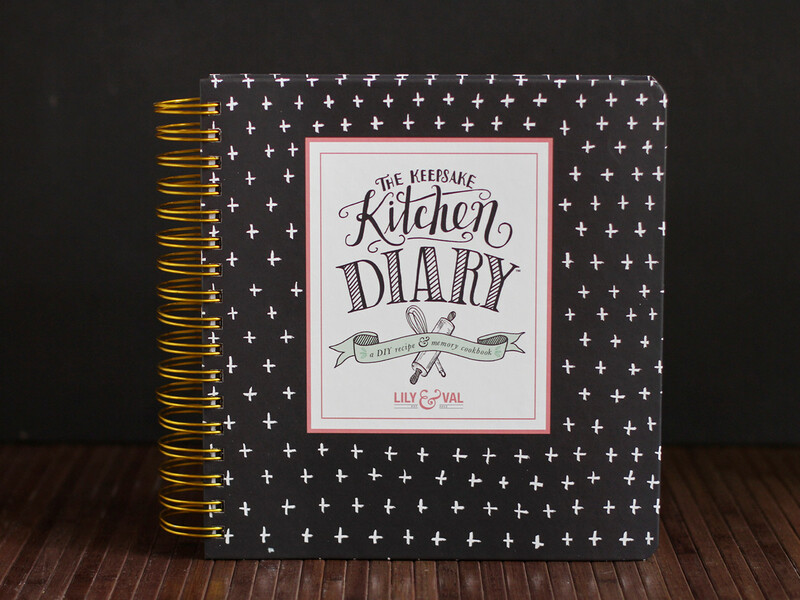 But mostly, it's a nice place to write down recipes that you want to keep. Or give away. Who's it for: Recipe savers. Pros: It's nice for saving or for giving away. Wishes: It would be great if extra pages were available to add to the book. 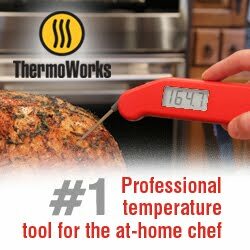 Thanks to the great folks at Thermoworks, I have a Thermapen to give away, plus I am supplying an autographed copy of Make Ahead Bread . 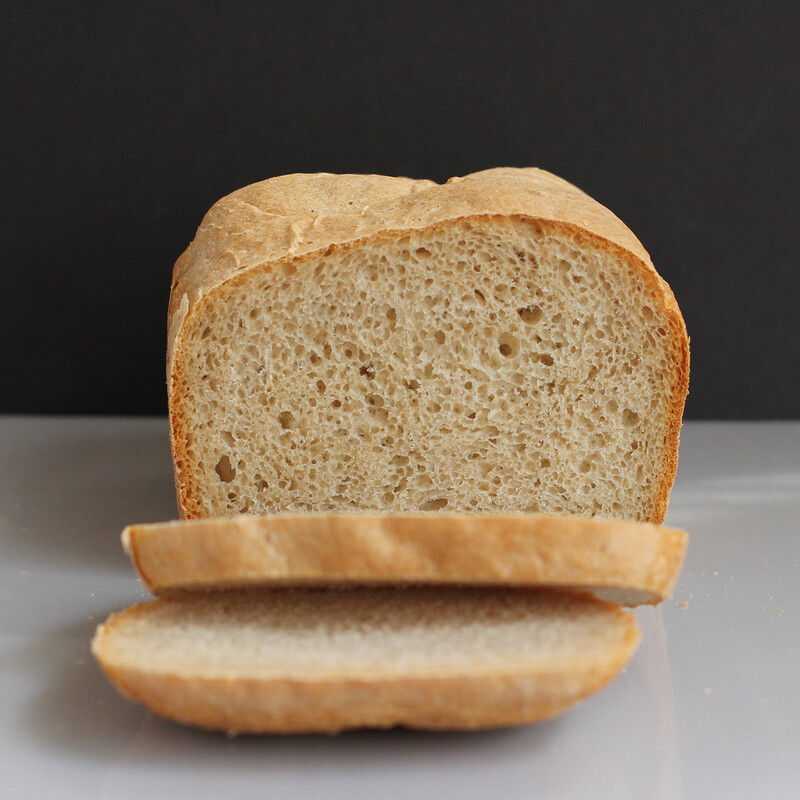 If your pod-style coffee maker and your bread machine romanced each other, the result might be something like the Salton Easy Bread . 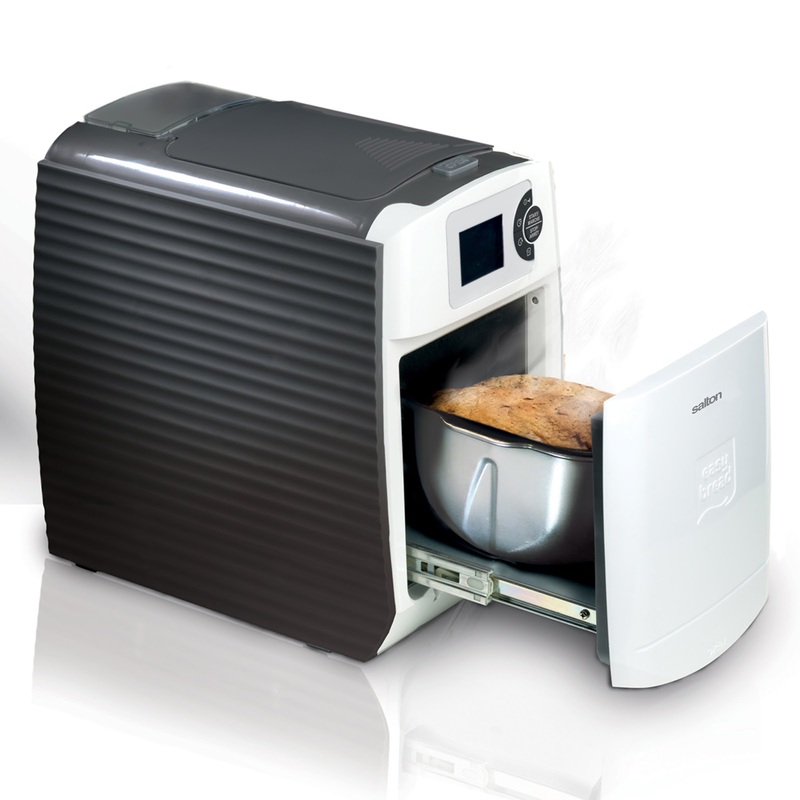 It's a bread machine for people who want the easiest process possible. It couldn't possibly be easier than this, unless your neighbor baked a loaf of bread and delivered it to you. 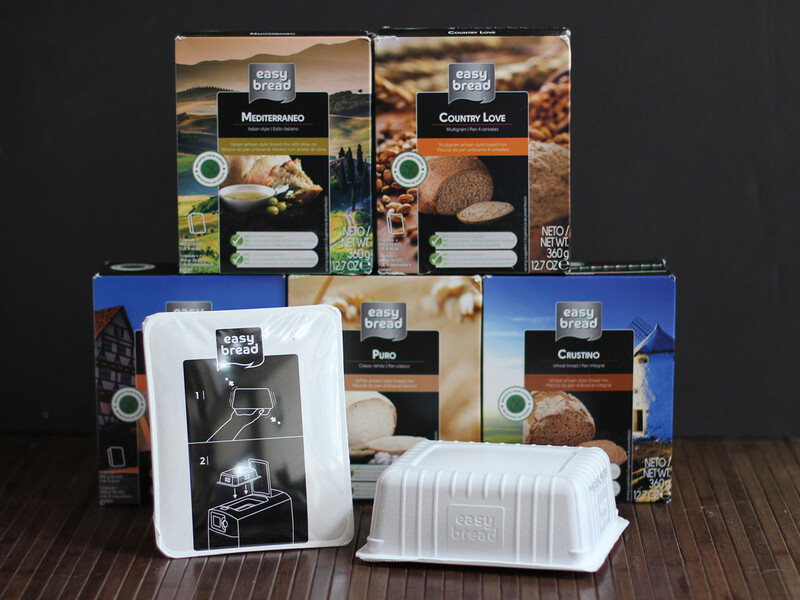 The concept is just like coffee machines, where you have your pre-measured coffee in a capsule or pod. But in this case, you have capsules that contain bread ingredients - flour, yeast, salt, flavors - that you insert into the machine. 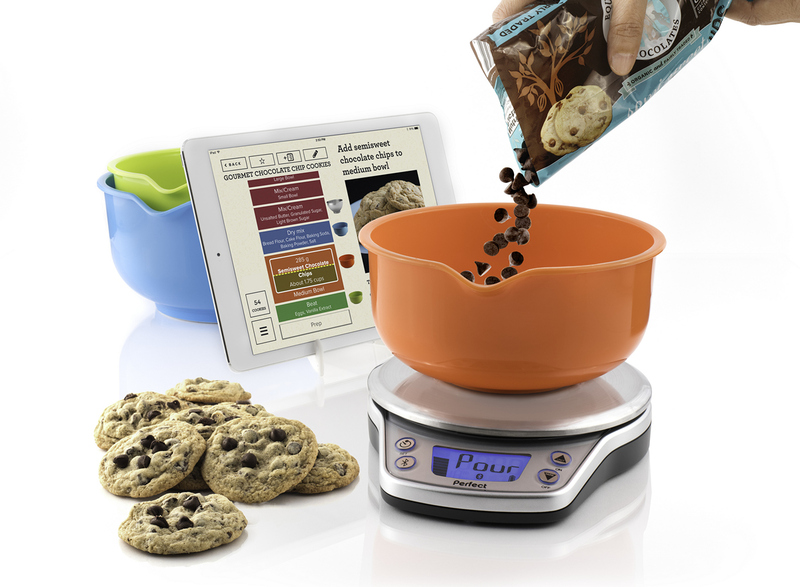 The machine pierces the capsule and the ingredients fall into the machine's mixing/baking bowl. There's a water container at the back of the machine - just like on your coffee machine - and it dispenses measured water into the bowl. Buttons on the front of the machine let you select a few basic things - like whether you want a light, dark, or medium crust - but other than that, it's all pretty automatic. When the bread is done, you open a tray in front, remove the bowl, and flip the bread out. Just like a regular bread machine. There are quite a few different types of bread mixes available, ranging from a basic loaf to one that's super-seedy and rustic. I've tried most of them, and they're all good. The loaves aren't as large as my other bread machine, but that's really not a problem. 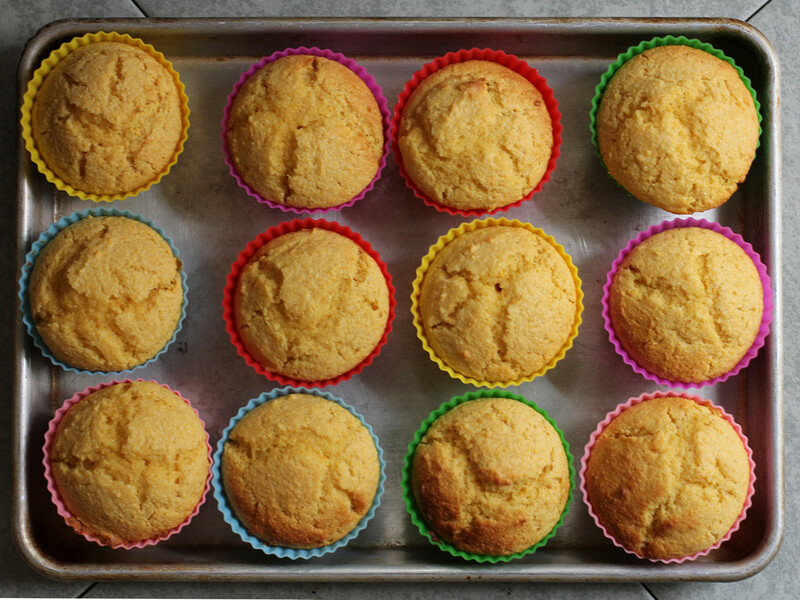 These are easy enough to make that folks could make a new loaf every day, if they wanted to. Who's it for: People who want a really easy way to bake bread. Cons: While there are a number of different types of bread, it's not infinite. Wishes: Make-your-own pods would be awesome. 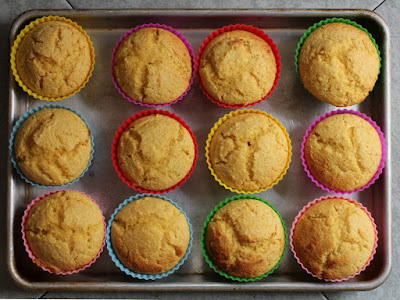 I could assemble my own recipes, store them, and when I want to bake it would just be really simple.